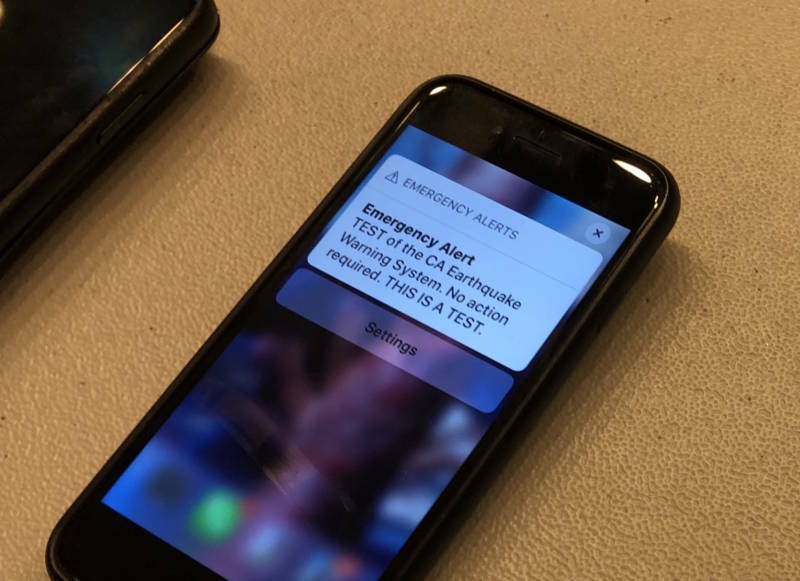 Scientists and disaster-response officials say they're encouraged after their first attempt to push out an alert from the state's newly-developed earthquake warning system to cellphones, over the same network used for Amber Alerts. State emergency services staff and scientists from the U.S. Geological Survey triggered the local test at 11 a.m. on Wednesday. 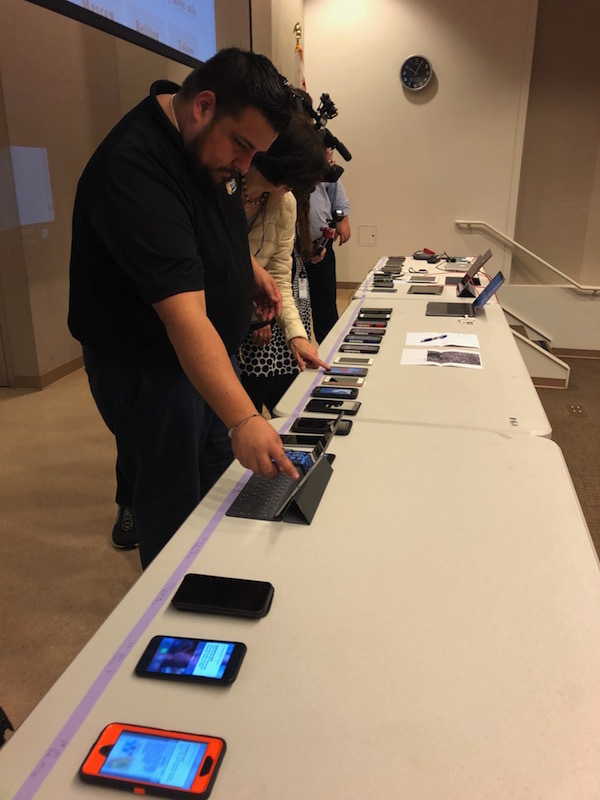 About 4 seconds later, an array of cellphones laid out in the downtown Oakland test center started lighting up and sounding off with a symphony of the familiar tones usually associated with Amber Alerts. This time, though, the subsequent text message advised users that this was only a test and no action was required. For the experiment, phones of various make, model and vintage were arrayed at the command center, going back to the flip-phone era. Most appeared to respond, though with varying time lags. Officials seemed pleased with the early returns. "This is a very big step," says Ryan Arba, the test coordinator for the California Office of Emergency Services. "We're going to look at all the data in total," he says "but we always have to remember that today, we have no seconds of warning," a reference to the fact that California currently has no comprehensive warning system in place for earthquakes. The recently-launched ShakeAlert system, co-developed by USGS and its university partners, provides anywhere from a few seconds to more than a minute of notice before shaking starts -- but only to institutions participating in a pilot program. Ultimately, the goal is to give everyone with a cellphone a few seconds to "drop, cover, and hold on" before the earth moves. "And you can actually be in a protected place before the shaking even starts," notes Arba, "which I think is pretty cool." Wednesday's test was not without its glitches: for instance iPad tablets in the test center did not pick up the alert. The challenge ahead is to get the system dialed in, so it'll work quickly and reliably with all devices. Toward that end, testers asked people within about a 10-block radius of Oakland's City Hall, to note exactly when the alert hit their cellphones, and report it on the CalOES website. As of Wednesday afternoon, more than 900 people had responded. "The people responding to that survey will provide us that feedback that we need to see whether or not we should move forward with this option." Extensive testing of the ShakeAlert system has proven its potential. A West Coast-wide network of ground sensors detect the very first burb from a developing earthquake, calculates the potential shaking and time before it hits a given location, and issues an alarm before the secondary wave -- the one we feel -- arrives. But according to Robert de Groot with the USGS, it's still unknown if the cellular system will be fast enough to relay that information in time, when seconds count. "That's the part we're testing," he says, "so this is citizen science at its best: you have all these people with their multiplicity of devices on them and they're gonna get this alert coming through them." Exactly when that will happen for everyone is still an open question, but officials say that with continued success in testing, it could be reality within a year's time.